Chris and Dave record from the same room! Weird! There will be a Sydney meetup, on Tuesday April 11th at 6 pm. More details here. You can also RSVP via meetup.com. Chris will be doing a meetup in Melbourne on Tuesday the 18th, with details to follow. He also may get to tour the Syncrotron as Dave did a few years back. They were ordering pizzas via computers all the way back in the 70s! Dave has played with voice chips in the past, like the SP256AL2. The Octavo chip is the main package on the BeagleBone these days. Someone made a version that fits inside the small version of the altoid mint tin. Microchip used to be called General Instruments. Potato Semiconductor sells super fast 74 series chips. Chris wrote about Continuous Integration in hardware. There was a really good post about the depth of the Hardware Development Process. Dave needs to restock his microcurrent, but each time is re-figuring out the order process. Amazon now has FPGA instances available via AWS. If you’re looking to learn FPGA stuff, we recommend things like the Arty board, the Papilio or the Xess boards. Chris was amazed by the tenacity of Pete during this talk about building a VNA. If you want to learn FPGA’s checkout nandland.com. Russell, the guy who set it up also has a youtube channel. Good videos that start at the very beginning of things. Have him as a guest on the show. Awesome! I bought a Go Board 3 days ago based on your recommendation and it arrived today. I have been pouring through the content on the nandland.com website – some a little basic, but it fills in all the gaps along with giving the deep stuff…. Thank you! 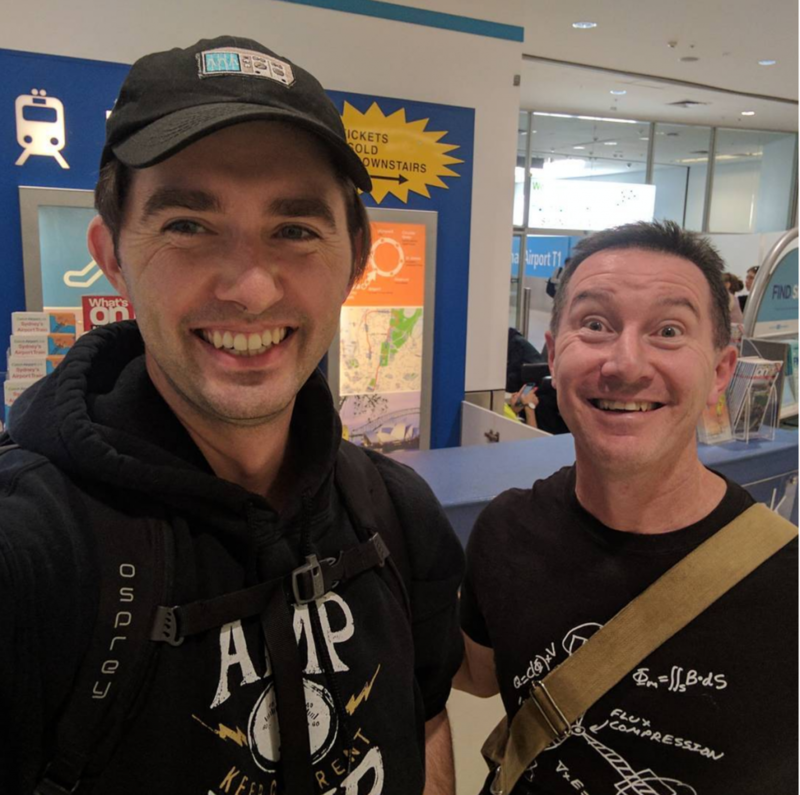 Chris and Dave – I am glad you finally met up! What video from Mike Harrison (White Wing Logic) where you guys referring to? Or the processor in the bedroom? Latin for going to the stars? Couldn’t find the lidor product from Lemnos, but regarding the impending robot revolution, this is a good video on the future of work and how automation is going to require us to re-think ‘work’! Regarding the Sandsquid alternative, Is Dave #2 planning on releasing or open-sourcing the straight from Altium to BOM/Purchase order script? Ledger sized paper is also called “tabloid.” I believe the tabloid newspaper gets its name from the paper size rather than the other way around. One of your later topics in the episode also touches tangentially on this same topic: Octavo Systems’ name refers to a paper size! Octavo is Latin for ⅛, referring to a method for producing books where 8 leaves of the final book are printed on a single large sheet of paper, which is then cut three times in half, giving 2³=8 double-sided leaves or 16 printed pages. Although octavo format originally referred to this process, the word became associated with the resulting book size, which is about the size of most modern books, ranging from cheap paperbacks up through typical hardbacks. (Excluding things like coffee table books.) That’s right, people figured out the proper size for books hundreds of years ago, when the printing press was young. Human factors haven’t changed, only the technology has. That makes the definition circular, leading to some confusion. A snooty term for a typical printed book is “an octavo,” even if it wasn’t produced by printing 16 pages double-sided onto a large sheet and cutting it down into 8 leaves. Hey, it’s great to see you two meet after all these years! Thanks for all your efforts producing the podcast!